THE SCANDIA BARN DANCE was an award-winning live radio program that aired on Seatttle’s KOMO radio from 1950 through 1952. 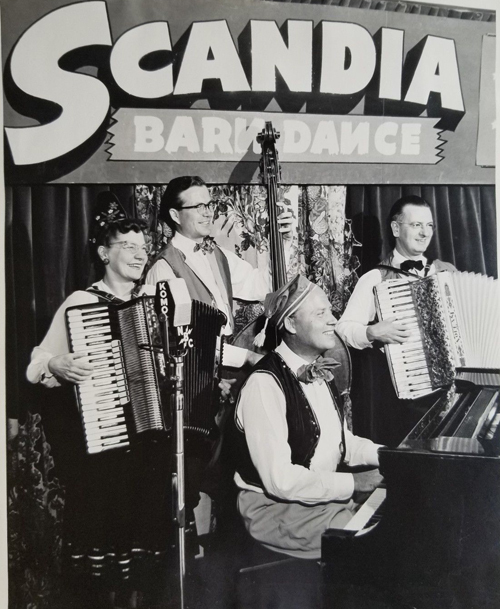 It featured a cast of musicians, singers, actors, and comedic talents who specialized in the sort of “Scandihoovian” entertainments surely appreciated by the area’s large population of Scandinavian Americans who dominated the Ballard neighborhood. The show’s house-band, the Scandia Quartet, was led by accordionist Greta Logan – and they were also popular city-wide having performed at the 1950 Grand Opening of the Northgate Mall, and supplied tunes for the summer Seafair festival’s square dances held annually at the Civic Auditorium (225 Mercer Street) and the Trianon Ballroom (218 Wall Street). 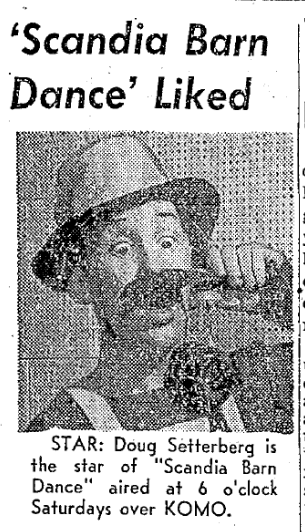 Other regulars included the singing duo – Loren Davidson & Ruth Stendal – announcer Frederick Lloyd (Lloyd G. Bloom, who’d begun as an actor on KJR in 1934, and then joined KOMO in 1944), and the zany dialect humorist Doug Setterberg (who started off on KOL’s Carnival Hour and then moved to KOMO, eventually becoming a writer and performer for Scandia Barn Dance). One highlight of each show was Settterberg’s serial monolog, The Little White Cottage Overlooking Shilshole Bay – “just a little bit south of North Ballard.” Setterberg later went on to wider notoriety as a musical partner, on records and television, with Seattle’s other great Scandihoovian humorist/musician Stan Boreson.